It all started with a post on Facebook. Come to think of it, quite a lot does these days. I'm going to redact the names of the parties to the FB exchange in question, to protect the innocent. Intolerance is not genetically encoded - it is taught. It is learned at home. It is learned in the classrooms and it is learned anywhere else we gather as a group. [...]"
A couple of years ago I saw a billboard that read: 'Nobody is born a bigot.'" [...] a recent article in Time on empathy approaches the issue of what CAN be taught: 'Increasingly, neuroscientists, psychologists and educators believe that bullying and other kinds of violence can indeed be reduced by encouraging empathy at an early age. Over the past decade, research in empathy — the ability to put ourselves in another person's shoes — has suggested that it is key, if not the key, to all human social interaction and morality.'" I chimed in at this point, to say I think that empathy is pretty much the whole ball of wax when it comes to "human social interaction and morality." Seems the caveman theory continues to be right, and that the quest for empathy may be harder to un-hardwire than might be hoped [...]." He included a link to a CNN article, titled "Skin color affects ability to empathize with pain." So what's "caveman theory" you may wonder? It's plenty of things, I suppose, including four hip hop guys from Florida. But in the shorthand between my correspondent and me it's the assertion that civilization is a veneer, that people are really not much different now than they were when humans lived in caves and clubbed their dinner. I'd been surprised, actually, to see this individual posting anything sympathetic about empathy in a socio-political context. I've read his view of humanity as Hobbesian for many years. When he and I talk about caveman theory, we usually take opposite positions. Ah, well, I thought when I received the follow-up email. CNN trumped Time, and my correspondent hasn't changed his stripes. I read the article. And that's where things got interesting. Humans are hardwired to feel another person's pain. But they may feel less innate empathy if the other person's skin color doesn't match their own, a new study suggests." Okay, the opening salvo supports my correspondent's revived pessimism about humans and empathic behavior. In the study, which appears in the journal Current Biology, people of Italian and African descent watched short film clips that showed needles pricking black- and white-skinned hands. As they watched, researchers measured the participants' empathy (i.e., their nervous-system activity) by monitoring sensors attached to the same spot on their hands. They also tracked the participants' heart rates and sweat-gland activity, a common measure of emotional response. "White observers reacted more to the pain of white than black models, and black observers reacted more to the pain of black than white models," says the lead researcher, Alessio Avenanti, Ph.D., an assistant professor of psychology at the University of Bologna." Hmmmm... Sounds like science to me. A whiff of Josef Mengele, perhaps, but science nonetheless. This may be real evidence. I can see why my correspondent might think this study is a game changer. But wait! Keep reading! The researchers also showed clips of a needle pricking a hand painted bright purple. Both the Italian and African participants were more likely to empathize with this intentionally strange-looking hand than with the hand of another race, which implies that the earlier lack of empathy was due to skin color, not just difference. 'This is quite important, because it suggests that humans tend to empathize by default unless prejudice is at play,' says Avenanti." Stop the ding-dang presses, people. This story doesn't conflict with what Colin Farrell said. My correspondent got it absolutely wrong. Both the Italian and African participants were more likely to empathize with this intentionally strange-looking hand than with the hand of another race, which implies that the earlier lack of empathy was due to skin color associated with learned racism, not just difference. Did my correspondent stop reading the article before he got to the purple hand paragraph? Did he fail to see what that paragraph really meant, despite the researcher's direct quote, because the preceding sentence was written less-than-well? Or was he not-so-interested in examining the article critically because it seemed on the surface to support a set of beliefs he tends toward in any case? Well, I don't know. He's pretty busy, I do know that. He's smart, analytical, and articulate too. So I'll venture some guesses: maybe, maybe, and probably. Maybe he only read part of the article, maybe he slipped in the muddy prose, and he probably wasn't inclined to see challenge in an article whose headline suggested support for his point-of-view. News readers gorge on media messages that fit their pre-existing views, rather than graze on a wider range of perspectives. In other words, they consume what they agree with, researchers say. I think that many people struggle with the ability to contain multiple ideas in their heads that are at first glance contradictory, but really just slightly more complex. [...] There's a great article on Slate I can't find right now, about how people reject scientific thought and the different ways they do that. Challenging your beliefs is difficult, it's easier (and more affirming) to find sources that support you and the idea that your truth IS truth. [...]"
I'm guessing my correspondent's misreading was the unconscious product of being in a hurry and an altogether human tendency to see what one expects or wants to. Caveman theory still looks pretty specious to me. You know already if you read my last couple of blog posts that I was in Providence, RI last week on business. At the end of the Project Bamboo workshop I helped to lead, I went for a swim at the local YMCA. Just what the doctor ordered. I took the bus up the hill, had a swim, and strolled back downtown along a route recommended by one of the YMCA staff. A few blocks along I passed the Olney Street Baptist Church. At the corner of the property a plaque was set in the lawn commemorating the Olney Street Riot of 1831. I knew nothing of Olney Street, little of Providence, and less of 1831 ... but my curiosity was piqued. I write about politics, I've seen a riot or two in my time, I was interested to know just what happened on that very spot some hundred eighty years ago. "Last Wednesday night, some disturbance taking place in Olney’s Lane, a sailor, a young promising fellow, 2d mate of the Ann & Hope, who was in search of the cook of the ship with two or three others, was shot dead from a house occupied by negroes, and the rest wounded. The alarm spread rapidly, and a large company assembled, and tore down the house and one or two other small ones, occupied by negroes. The next night, the moon shining bright, an immense multitude gathered in the Lane, and began to show signs of tearing down more houses. The Governor, Sheriff and all the watchmen were on the spot ready to prevent it, if they could. The first who commenced, were immediately seized by the Sheriff and watchmen, who succeeded in holding only two of them, after hard fighting; the mob then burst forward, and drove all the watchmen off, and commenced pulling down all the bad houses in the Lane. They stationed sentinels, and went to work as busy as bees, first pulling down the chimney, and then with a fire hook and plenty of axes and iron bars tearing down the buildings and pulling them into the streets. The air was so still, and the weather so pleasant that Elisha tells me he could hear them talk when he was at the mill. The whole street was full of spectators, a great many of whom were cheering the mob every time a house fell. About 11 o’clock the Governor ordered out the 1st Infantry, and they marched up the Lane, but the mob stopped work and surrounded them, throwing stones at them, hissing and hooting, &c. Several of them were badly wounded by the stones, and they had to retreat. As soon as they were gone, they began work again, and leveled 8 or 9 buildings with the ground. They then marched over to Snowtown, and tore down two or three houses there, breaking windows in others. It was then near 4 in the morning, and they dispersed." Because I am not directly wired to the intertubes (I don't even carry an iPhone), I didn't find all that out on the spot. I took note of the plaque, and continued down the hill. The route recommended to me by the woman at the Y was a good one. The quiet streets of the College Hill neighborhood were lined with tall old trees populated with warbling, orange-breasted birds. Boxy nineteenth century houses were shaded by these great trees, many of the residences crowned with dormer windows and marked by plaques indicating for whom the home was originally built, and when. It was a settled-in neighborhood, a neighborhood with a past. I came to Prospect Terrace Park, overlooking the city center, the site of the statue and tomb of Roger Williams, the founder of Rhode Island. A preacher, Williams shaped the growth of the then-colony "through its acceptance of settlers of all religious persuasions," according to a brief biography on a site maintained by his descendants; as Wikipedia tells it, he was "the first American proponent of religious freedom and the separation of church and state." I don't think my social studies classes covered Roger Williams when I was in grade school. I didn't realize the statue in the park represented him because I didn't know who he was, let alone that dust from Williams' grave is interred beneath the statue -- and I didn't get any of that figured out until I had a chance to do some on-line research. Once I returned home I also did some nosing around in a couple of the field guides I keep handy; I believe the birds I noticed were Baltimore Orioles. They sang a lovely song. All in all, it was a nice walk, but I would hesitate before setting a story in Providence. My knowledge and experience is too thin. 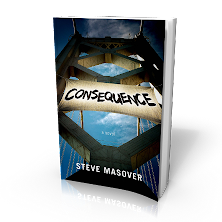 My current novel project is called Consequence, and much of it takes place in San Francisco. A collective of political activists at the core of Consequence live in the Duboce Triangle, a neighborhood in the geographical heart of the city. The building where the collective makes its home is roughly modeled on a building near Duboce Park, one owned by old friends and housemates. I've been in the neighborhood many times, over many years, in every season, weather condition, and hour. Once or twice I was even in the vicinity for a police riot. While I have taken certain liberties -- adding a corner store here, pumping up the vibrancy of a street scene there -- I am confident that the city I describe bears a close resemblance to the actual neighborhoods depicted in my fiction. Recently one of the owners of my model-building asked if he could read Consequence in typescript. M-- is an old friend, he's been a friend for nearly half my life, and I was interested in his take for a lot of reasons: because I've been 'borrowing' his home for all the years Consequence has been gestating; because M-- and I have done a fair bit of political work together; because he's a very sharp reader (we almost never like the same books ... but it's great fun to argue our often diametrically opposed opinions). M-- gave me some terrific feedback, but the bits I want to point out here have to do with place. He lives in the neighborhood in which much of my novel occurs, and I don't. He's there pretty much every day, and has been for more than a decade. I'm not, and haven't been. So there were a number of details in my draft that rang false for him. That street scene I portrayed with enhanced vibrancy? Nope, it's not like that, he said. The way I describe the location of the collective's home in relation to the borders of the neighborhood? Not quite right. The 22 Fillmore bus route? It travels north-south, from the outskirts of the city to a neighborhood closer to the center, but people don't say that it goes "downtown" as one of my characters thought to himself. I think his comments were mostly on the mark. Not surprising, M-- lives closer to the place my novel is set than I do. And some of his complaints will motivate me to nip, tuck, and otherwise improve my portrayal of place in Consequence -- in some cases I already have. But I do think that some of the details that struck M-- as oh-so-wrong are not going to matter once readers get their hands on this novel. Some of the details of place that I wrote ring true within the novel's frame, even if they deviate from the precise character of the Duboce Triangle, or from M--'s experience or perception of his neighborhood. For most readers of Consequence, the Duboce Triangle will remain a fictional construct. And that's okay by me. I'm far from the first to write about place in fiction. I'm may not even be among the first hundred-thousand. Just last month, my favorite agent-who-blogs, Nathan Bransford, wrote a post on What Makes a Great Setting. Two out of the three books about writing fiction that I keep nearest to my keyboard include chapters on place: The Gotham Writers' Workshop Writing Fiction ("Setting and Pacing: I'm here, therefore I am"); and Noah Lukeman's The First Five Pages ("Setting"). I don't think the topic has been exhausted. In fact, I have every intention of coming back to it. It supports further musing and new examination, by writers and readers both. In that light, I wonder what you have to say about places you know through fiction. If you're a reader, how important is a novel's rendering of place to your experience? Do you care whether an author is accurate in her portrayal of places that are passed off as 'real'? Always, or only sometimes? If you're a writer, how close do you like to stick to places you know deeply? How comfortable are you writing about places you know only superficially, or through research? 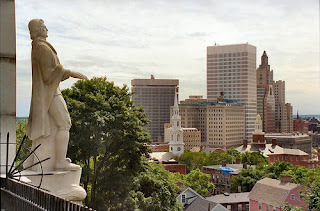 Thanks toWill Hart for the photo of the Roger Williams statue in Prospect Terrace Park (CC BY 2.0). Are computer languages really languages? 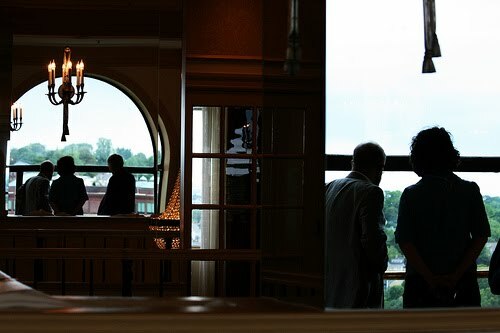 A group of professors, librarians, and information technology professionals from a mix of universities joined in spirited conversation at a reception on the 18th floor of the Providence Biltmore Hotel last week, responding to the friendly provocation of a colleague. The topic: should Ph.D. candidates in the humanities be permitted to fulfill their programs' language requirements by learning a computer language? Currently, doctoral candidates at most universities are required to learn one or more human languages in order to complete their degrees. pass a departmental examination in French, German, Greek, or Latin requiring the translation of 600 words in two hours with the use of a dictionary." show proficiency in either two ancient languages, or two modern languages, or one ancient and one modern language. A reading knowledge of one modern language is often required for a Master of Arts degree, and two languages for a Ph.D. degree. All students must complete one year of a non-Indo-European language or one semester in the structure of a non-Indo-European language. Interested in getting a doctorate in French at Penn? In addition to French, students are required to demonstrate reading knowledge of another foreign language, normally one that is used significantly in their chosen field of specialization." None of these advanced degree programs accepts knowledge of a computer programming language in fulfillment of its foreign language requirement. Should they? Credible arguments were advanced on each side of the debate at the Biltmore. To a suggestion that human languages contain a wealth of implicit and explicit culture, and of perspective that may differ significantly from that contained in another, a pair of IT professionals responded that the logically rigorous intellectual culture in which computer programming is grounded is different from cultures familiar to many (and perhaps most) humanists. They asserted that programming languages are deeply useful and important -- arguably essential -- to those who wish to understand the modern world. Programming languages, they proposed, reveal alternate views of the world as well and fully as human languages. Some suggested that a scholar's engagement with sophisticated software tools would equip her to utilize technology in the service of humanist inquiry, without need to grind through actual coding. Others replied that inability to decipher the assumptions implicit in the way those tools are realized (via code) render their workings opaque, and their utilization clumsy and superficial. Most agreed that where a doctoral language requirement reflects expectations that a Ph.D. ought to be able to access knowledge in the dominant languages of the academy, the requirement verges on outdated. While knowledge of French, German, Greek, and Latin might once have opened access to most of what is known by European academics, the languages of scholarly discourse over the past several millennia, in Europe and elsewhere, are far broader than these. Moreover, the conceit that knowledge of multiple languages might permit a single human mind to ingest most or all the scholarship of any substantial discipline may have been credible some hundreds of years ago, but today is ridiculous. There's too much out there. Not long after the reception ended at the Biltmore, I wished I had advanced the argument that grasp of a programming language's syntax and the ability to code up a few simple classes or subroutines is no guarantee a newbie programmer will grok the intellectual framework on which that language is based. But then I got to thinking further. It's also true that mastering a few semesters of Greek doesn't equip a person to deeply understand Homer, Plato, and Aeschylus. I'm trying to maintain a semblance of equanimity here, but I don't suppose it's hard to see where my sympathies lie. On the other hand, I'm not a linguist. And I think the world will be a better place if I decline to play one in the blogosphere. So I hearby solicit your opinion. Is it as intriguing to you as it was to last week's gathering on the 18th floor of the Providence Biltmore to consider whether computer programming languages are equivalent in intellectual power, expressive richness, or cultural significance to human languages like English, Chinese, French, Arabic, German, Sanskrit, Spanish, Russian, Farsi, or Japanese? Do you think a computer language ought to fulfill a foreign language requirement for any or all Ph.D. programs in the humanities? Or not? The other evening I was walking up Westminster Street in Providence, Rhode Island, a city I'd visited only twice before. A white-haired gentleman wearing a windbreaker passed me going the opposite direction, and nodded in a friendly way. I nodded back in a friendly way, why not? A few steps further on I heard the man call back to me. I turned around. He started to tell me a story. Establish an empathetic connection: the teller and listener are both "one of us"
The first time I heard this story was in the city where I live, about thirty years ago. I was walking up Telegraph Avenue in Berkeley, California, when a man hailed me at the corner of Blake Street. He'd been driving home from work, and his car broke down. Maybe it was the radiator, maybe it was the clutch -- I don't remember, this was thirty years ago. Anyway, he had a family waiting for him at home, and it was going to cost plenty to get his car fixed but he had no money on him -- and he wouldn't be able to fix the car 'til the next day anyhow, because the shops were all closed -- but he could come back to Berkeley tomorrow and get it all straightened out after getting money from home ... only because his car was broken and he didn't have any cash on him he couldn't get home. Bus fare out to Milpitas (or wherever it was he said he lived) was $4.55, he explained, and asked if there was any way I could see clear to loaning him bus fare, he'd be so grateful, and of course he'd pay me back. I was skeptical. This was Telegraph Avenue in Berkeley, you couldn't (and still can't) walk thirty feet without somebody spare-changing you, and I'd grown reasonably hardened. But this guy was so sincere. And his story seemed so much more ... particular than those told by the usual incoherent layabouts. And he wasn't asking for money to fix his car, only enough to get home. So I gave him a five. He asked me for my address so he could mail the money back to me. Hmmmm. Okay, I just gave the guy five bucks, which means I believe he's telling me the truth, that he's not pulling a low-stakes con, right? But do I believe him enough to give him my address, just a few blocks away from the corner we're standing on? No, I didn't. Now that he'd gone that extra step, trying to make arrangements to pay back five bucks, I started feeling a little bit stupid. Well, five dollars wasn't the end of the world, lucky for me. I told him to forget it, and -- over his protests, his insistence that, really, he can't take my money if I won't allow him the chance to repay it -- walked away. Imagine how sheepish and disgusted I felt when the next week, or maybe it was the one after, the same fellow approached me on Shattuck Avenue and started to tell the same damn story. I was also fascinated. I listened long enough to see whether he'd ask for the same sum of money -- and he did! he asked for exactly $4.55! -- before reminding him we'd met a couple weeks back and he still owed me five bucks. He skedaddled. I didn't fall for the tall tale again. Not that second time on Shattuck Ave., nor the times after in Berkeley, Oakland, San Francisco, or Santa Cruz. I've had guys (and women too) try to tell me this story all over, one time in Seattle, another in New York. And this week in Providence. Sometimes the story's about getting home from work (hey, I'm a working stiff, just like you); sometimes it's about paying for prescription medicine; sometimes about getting home to feed a brood of kids. There's always a specific sum of money involved, and usually a vivid disclaimer that the storyteller never found him or herself in this situation before, would never ask a stranger for money, couldn't possibly ask for a handout but would insist on paying back a stranger's assistance. No one's ever tried to pull the similar, better known gas can or robbed traveler cons on me. But I keep attracting this one. I guess I look like a particular kind of sucker. This time? This time, like the last dozen or so, I didn't wait around to hear the full setup. The fellow in the windbreaker apologized effusively for bothering me and explained me he'd been driving from Groton, Connecticut on his way to Brockton, Massachusetts -- all this in a rush of words, he couldn't have taken more than seven seconds -- I shook my head, turned, and continued on my way. I'd heard that story before. Have you? Has anybody missed BP CEO Tony Hayward's perspective on his company's oil spill in the Gulf of Mexico? Datelined a month ago today: "The Gulf of Mexico is a very big ocean. The amount of volume of oil and dispersant we are putting into it is tiny in relation to the total water volume." The U.K.'s Guardian reported this bit of homespun wisdom on 14 May 2010, when the U.S. gov't fantasized that 'only' 5,000 barrels per day were leaking into that "very big ocean." Estimates reported in the NY Times on Sunday were in the neigbhorhood of 35,000 barrels per day, perhaps more. But hey, that's only a factor of seven. The ratio of "tiny" to "very big" is way more than that, right? The truth is, I missed Hayward's idiotic blather until late last week. Yeah, I heard that BP was having trouble with its CEO's waywardly wagging tongue, but I have a kind of squeamishness about gossipy, personality-driven news reporting. I try to avoid it. Never mind gossipy, personality-driven politics (you know, all that worry about whether President Obama is emoting enough to satisfy the news cycle, about which Nicholas Kristof had what I regard as the last word, last week). Well, if the oil spill in the Gulf of Mexico leaves you indifferent, how 'bout news from another beleaguered body of water, the Persian Gulf. Yeah, that one over by Iraq & Iran & Kuwait. Withered by decades of dictatorial mismanagement and then neglect, by drought and the thirst of Iraq’s neighbors, the river formed by the convergence of the Tigris and the Euphrates no longer has the strength the keep the sea at bay. The salt water of the gulf now pushes up the Faw peninsula. Last year, for the first time in memory, it extended beyond Basra, Iraq’s biggest port city, and even Qurna, where the two rivers meet. It has ravaged fresh-water fisheries, livestock, crops and groves of date palms that once made the area famous, forcing the migration of tens of thousands of farmers. Readers of this blog know by now that its author is deeply skeptical of claims that technology will fix massive & complex environmental problems -- like those caused by extractive industries that are gross polluters at their existential core, or the increase and migration of populations whose needs can't be met without ravaging the watersheds in and near which they live. a time, possibly just a couple decades from now, when a superior intelligence will dominate and life will take on an altered form that we can’t predict or comprehend in our current, limited state. At that point, the Singularity holds, human beings and machines will so effortlessly and elegantly merge that poor health, the ravages of old age and even death itself will all be things of the past." Attendees at the spring session came from all over the globe and included John Mauldin, a best-selling author who writes an investment newsletter; Stephen Long, a research director at the Defense Department; Fernando A. de la Viesca, C.E.O. of the Argentinean investment firm TPCG Financial; Eitan Eliram, the new-media director for the prime minister’s office in Israel; and Guy Fraker, the director of trends and foresight at State Farm Insurance. Silicon Valley investors, former astronauts, and more of the very very rich round out the roster. We will transcend all of the limitations of our biology. That is what it means to be human — to extend who we are. [...] Ultimately, the entire universe will become saturated with our intelligence. This is the destiny of the universe." I don't quite see how I can add anything to that. Fade to black. when a person's name matches their personality or career choice," a.k.a., "the phenomenon of nominative determinism." Sunshine has been blogging about wine and food lately. One gentleman she blogged about recently is social media director at a Napa Valley winery; his name is an Americanized from the proper spelling of the Roman god of wine, Bacchus. This isn't the first time she's blogged about aptonyms. In fact, Sunshine admits to something of an obsession with this oddity of language. I cede the field to her demonstrated connaissance, but she did get me thinking about inversions of this phenomenon. Creating a name to suit a character is something I toy with all the time when I write fiction. In one short story, for example, I named a character who mentors another "Raymond," because I liked that the name is composed of Germanic words that mean "counsel" and "protection" (says the appendix of an old Random House College Dictionary I often rely on for such things, not to mention Wikipedia). While I say "toy with," I'm actually pretty circumspect when playing with etymologies of names. These days, unless one is writing with tongue firmly planted in cheek, one doesn't want to lather it on too thickly. I'm not really expecting readers to notice that "Raymond" is aptly named. It's the kind of detail I attend to for my own satisfaction. Sure, laying it on thick works for some. 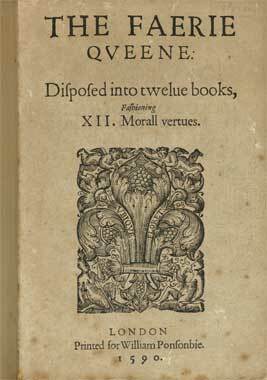 It worked for Edmund Spenser, whose Faerie Queene (the queen's name is Gloriana) is littered with monsters named for the sins they allegorically represent; and brothers name Priamond, Diamond, and Triamond; and Una who represents the one True Church; and Duessa who ... doesn't. It worked for arch, parodic cartoon characters like Dudley Do-right the straight-arrow Canadian Mountie of Rocky and Bullwinkle Show fame, not to mention his horse, Horse. It works for arch, parodic novelists too, like Ian Fleming: think Tiffany Case, the diamond smuggler in Diamonds are Forever; or Red Grant, an executioner run by Soviet counterintelligence in From Russia With Love. And then there's Darth Vader and Voldemort and the like, but we're talking serious cheesiness there. Another twist on characters named to amplify aspects of their occupation or personality are characters who walk out of stories to inhabit our common vocabulary. Have you ever called someone a scrooge? You have Charles Dickens to thank. Ever say "No sh*t, Sherlock" to some dimwit who has just articulated the obvious? Thanks due to Sir Arthur Ignatius Conan Doyle. Might you call "a monstrous creation" a "frankenstein"? Mary W. Shelly will accept your homage. It works for mythical characters too. A singular vulnerability is an "Achilles' heel." Extraordinary power is "herculean." And if it makes you blush to say that someone masturbates, you could always say he practices "onanism." Then, of course, there's the pedestrian fact people's surnames were once commonly adopted to indicate what they did for work. Ever known somebody named Miller or Baker or Smith? None of these twists gives quite the same frisson as an aptonym. The thing that prickles one's scalp on meeting a person whose name describes their fate is just that possibility. Fate. Was this person destined to become what she became simply by accident of a name acquired at birth? In a culture that values choice and agency, evidence suggesting you become what you're called is disquieting. A name given by a writer to a character conceived and shaped in imagination is something altogether different -- a handle for a character type or an allegory, in some cases. And a character whose name becomes shorthand for describing a personality trait or type is tribute to fine storytelling, not a sign of predestination. I think it's a thin line for fiction writers to walk. What do you think? Do you always roll your eyes when an author signals character through the name s/he's chosen? Or only when it's too, too obvious? The west entrance to the UC Berkeley campus has been a site for quiet political vigils for almost as long as Sproul Plaza has been a nexus of boisterous student activism. I ride my bike past the West Lawn pretty much every day on my way to work. For ten years I held a job in an office on the sixth floor of University Hall, just across the street. I don't remember a time before a group of men and women -- older than students, generally, and nowadays downright elderly -- gathered regularly (often weekly) on the lawn to hold signs, meditate, and otherwise express opposition to the proliferation of nuclear weapons. They bring any of several banners to these vigils, but the one they never fail to unfurl reads "TV Debate on Nuclear Weapons Needed Now." They've been holding that very same banner in the very same spot for years and years. 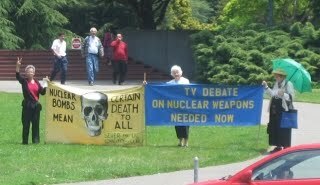 So why would a peace group hold long-running anti-nuke vigils on the West Lawn? The University of California manages the two national laboratories that perform classified research for the U.S. nuclear weapons program, the Los Alamos National Laboratory (LANL) and the Lawrence Livermore National Lab (LLNL). UC exclusively managed the labs from LANL's formal inception in 1943; until just a few years ago, when management was contracted to a Limited Liability Corporation made up of UC, Bechtel National, Inc., The Babcock & Wilcox Company, the Washington Group International, Inc. and Battelle. Opposition to UC management of the labs germinated through the 1960s, and came into full flower by the early 1970s. By the time I arrived on campus as a freshman, in 1978, faculty and student protest was vociferous and highly visible. My first-quarter physics professor, Charlie Schwartz, was a prominent faculty critic of UC's ties to the weapons labs (and he delivered a mean lecture in introductory physics besides). The core argument: university oversight provides a deceptive veneer of legitimacy to military development that poses harrowing danger to the future of humanity and the planet. The (then) nine-campus University of California system used to be administered from the top floor of University Hall (UC's Office of the President moved to Oakland in spring 1998). That is, the head office of the organization that managed the labs -- whose work drove the nation's nuclear weapons complex -- was directly across the street from the West Lawn where those anti-nuke vigils are still taking place. I stopped by last week to spend a few minutes chatting with the three women holding the banners in the photo shown on this page. They told me that they'd started bringing the "TV Debate on Nuclear Weapons Needed Now" banner to vigils in 1979, which explains why I had the impression they'd been coming around just about forever. If I hadn't stopped to talk I might have written a more snarky post than this one. The truth is, I find it depressing and distressing how hopelessly out-of-date their banner's message reads to twenty-first century passers-by, even sympathetic passers-by like yours truly. After thirty years of seeing it decorate the West Lawn anti-nuke vigils, riding my bike by this banner leaves me feeling numb and hopeless. Its recurring presence seems to imply that activism is something practiced by people who are dogged, stuck-in-a-rut, irrelevant buffoons; and that activism's effect is, essentially, nil. I mean, really ... a debate? On TV? Now? That's going to turn the tide? But it wouldn't have been fair to write all that out unless I engaged with the banner-holders. So I asked the tenacious women whether they thought their message was on-point, and they convinced me, in a meandering sort of way, at least that they meant well. Our work is based on the principles of the Religious Society of Friends, the belief in the worth of every person, and faith in the power of love to overcome violence and injustice. As she spoke, I began to understand that these activists' intention in standing on the West Lawn with the same banner for more than thirty years is not so much about pressing particular bureaucrats (who left the building a dozen years ago) for specific political demands (a TV debate isn't the goal, after all). It's about planting seeds of awareness, urgency, and commitment in the minds and hearts of the thousands upon thousands of students, faculty, staff, visitors, and citizens who pass by or through the west entrance to the campus over the course of decades. It's not a path I would choose, I thought as I pedaled to my office after our chat, though you'll see in a few lines that I probably wasn't thinking very clearly. In any case, I felt a little less snarky. It was one of those "how can we lose when we're so sincere?" moments. Later I was mulling over Abu Ghraib, and orange jump suits, and the years I spent demanding an end to torture and extralegal detention inflicted by the U.S. government. How? Well, largely by standing and marching and leafleting in an orange jump suit. I did this on street corners and plazas, atop freeway overpasses, in shopping malls, alongside Fourth of July parades, outside Senators' offices, in airports, and on ice skating rinks, with fellow-activists in a group called Act Against Torture. AAT took up much of my political bandwidth for several years beginning in late 2005. If you want to see a lot of pictures of Bay Area lefties in orange jump suits, visit the group's photo gallery. Were our exploits in orange jump suits really so different from the women standing with their trusty banner on the West Lawn? Wasn't it really the exact same thing, only our mode and message were a little bit more of-the-moment as the horrors of Abu Ghraib, Bagram, and Guantanamo first came to light in the mainstream print and television media? The Obama administration has won the legal right to hold its terrorism suspects indefinitely and without oversight by judges — not at Guantanamo or in Illinois, but rather at the Bagram air base in Afghanistan. Reaching anew for peace, President Obama and Russian President Dmitry Medvedev on Thursday signed a treaty to shrink their nations' nuclear arsenals, the biggest such pact between the former Cold War foes in a generation. Tenaciously negotiated by even the leaders themselves, the treaty commits their nations to slash the number of strategic nuclear warheads by one-third and more than halve the number of missiles, submarines and bombers carrying them. So is it just that change takes time, and the women on the West Lawn stuck with it longer than I did? All this musing brought me back to my friend Kate, the woman who called together a group of activist friends to launch Act Against Torture, and about whom I've blogged before in several different contexts. The last time I mentioned Kate it was to plug one of her recent blog posts, Ordinary People Can Change the World. If you didn't read it then you might want to have a look now. She followed up with a post that I thought even better: Is Failure the Chicken and Success the Egg? Her thesis (though really you should read that one too, start to finish) is that you never know which attempts to make the world better are going to succeed, and which are going to come to naught. You think you can see the difference in hindsight, but in the moment a person acts, s/he hasn't got a clue whether her actions will turn out to be futile ... or whether it's the very thing that's going to catalyze real and meaningful change for good. This truth might be pretty good grounds for biting one's tongue when tempted to be snarky about somebody else's impotent political tactics. I don't think I'll change my dim view of the transformative potential of TV debate on nuclear weapons. Still, perhaps the women and men who have been holding that sign on the West Lawn since shortly after I showed up for freshman physics are teaching a lesson worth learning. Here's a tale of two UCs -- the University of California and the University of Chicago. If crisis is opportunity, it's time for the university system I work for to pounce. Alas, the University of California -- ten campuses, 231,853 students (Fall 2009), 96,914 full-time and 86,753 part-time staff (October 2009), a $15.6 billion budget (2009-10), all in a state that's been trying for years to divest from higher education -- isn't exactly positioned for agile pouncing. Nonetheless, according to a 9 May article in the Chronicle of Higher Education, UC has big plans for pushing online education (a.k.a. "distance learning") into the hallowed halls of elite academe. This fall [leaders at the University of California] hope to put $5-million to $6-million into a pilot project that could clear the way for the system to offer online undergraduate degrees and push distance learning further into the mainstream. [...] plenty of universities have offered online options for years, and more than 4.6 million students were taking at least one online course during the fall-2008 term, notes A. Frank Mayadas, a senior adviser at the Alfred P. Sloan Foundation who is considered one of the fathers of online learning. "It's like doing experiments to see if the car is really better than the horse in 1925, when everyone else is out there driving cars," he said. The proposed pilot is generating loads of debate, firing up professors at UC Berkeley (where I am a member of the staff). Many professors are outraged at the proposed dilution of the campus "brand" ... and dismissive of claims that online courses in any way resemble the quality of education offered in classrooms and lecture halls, where students have direct access to and challenge from the faculty and each other. Daniel Greenstein, a UC vice provost, says that elite public universities have resisted following a trend associated with community colleges and for-profit institutions. "A move online could be seen as an admission that you're moving downscale." "What I fear is that the coalition of the willing among frontline faculty who would like to pursue this idea will be stopped dead in their tracks by the bureaucracy." The University of Chicago is not known for its bread & roses economic theories. Indeed, the "Chicago school" of economics is practically a synonym for free market libertarianism. In that context, you might not think of the University of Chicago Press as an innovator in the information-wants-to-be-free realm. But, against expected type, Chicago Digital Editions, the e-publishing arm of UoC Press, is giving away a free e-book every month, and has been doing so since November of last year. According to a 10 May CHE blog interview with press director Garrett Kiely, it's a bid to understand better how customers interact with the electronic forms of the academic titles the press offers. Offerings have included older general-interest books as well as new volumes for which the press is eager to generate attention. The authors have been pleased that their books are getting out and being used and they appreciate the additional marketing push for their other books. They understand that this is a time-limited promotion and they have been supportive. I'm not going to attempt to draw any grand conclusions here. It's simply worth noting, I think, that fluster, confusion, and foundational shifts around the digitization of information isn't limited to commercial publishers. At elite universities, there's fluster, confusion, and foundational shift aplenty.